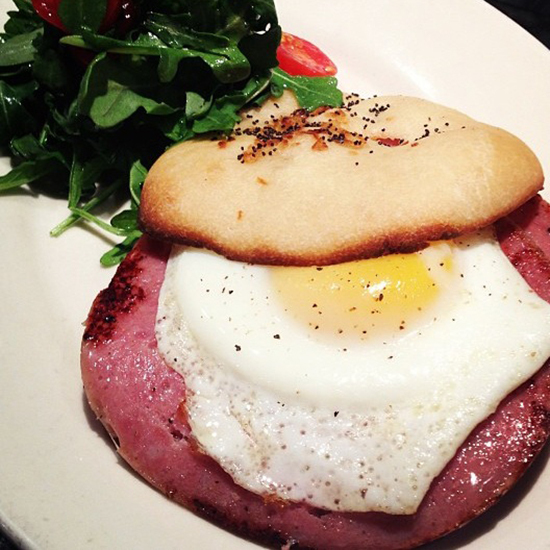 What: Pork roll is the star of chef Brad Spence's Jersey Cannonball. The salty cousin of bologna, pork roll is a longtime staple in parts of New Jersey, though its cold-cut character isn't exactly to everyone's liking. But at Amis in Philadelphia, Spence makes his own and serves it in this beast of a breakfast sandwich, with fried egg, pecorino and pickled hot pepper relish, all on an onion bialy (like a flatter, sturdier bagel). Wash it down with: The Fra Diavolo Bloody, which includes Dijon mustard and sriracha right in the mix alongside the classic horseradish and Worcestershire.